If you want to have a lighter feel to your cake and bring a touch of your own personality to the design then look no further than our wide range of novelty cakes. Any theme or hobby can be incorporated into the design, and if you decide upon adding sugar paste figures, these will be finished to look like the bride and groom (as far as is possible with sugar paste!) including wedding dress and suit design. For this wedding, the couple wanted to show how and where they had met, and that they were both off to live overseas after the wedding. 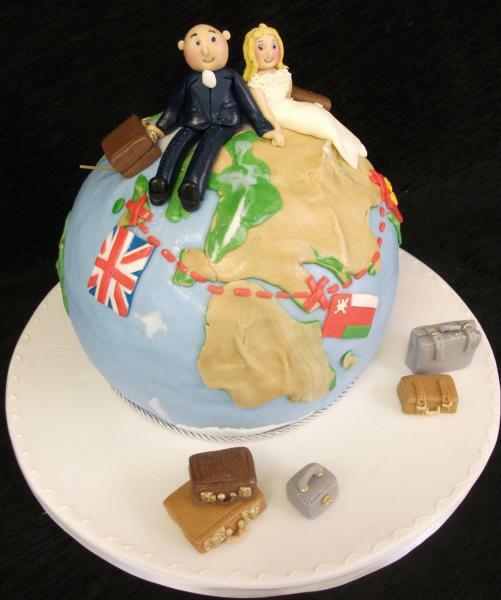 The sponge cake was formed into a large globe, and adorned with travelling bride and groom, complete with suitcases and detailed flight path! 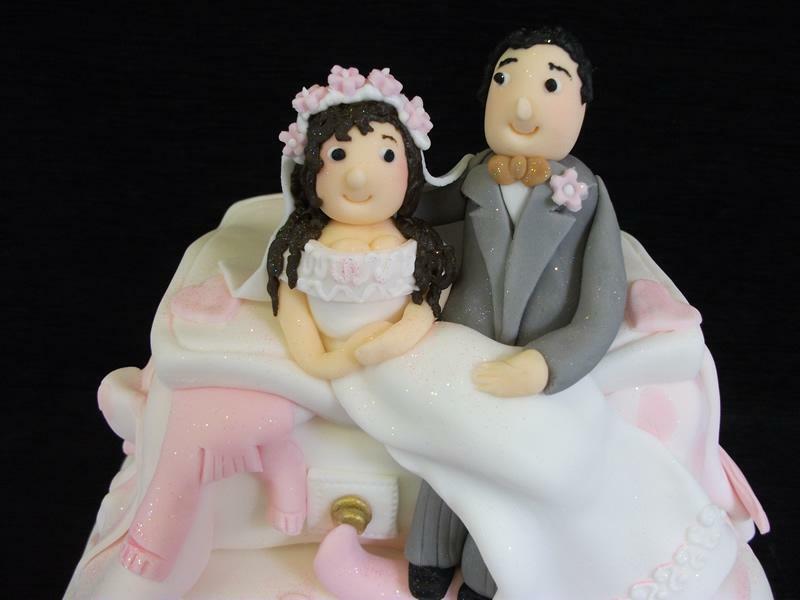 Sugar paste figures are hand modelled to represent the bride and groom in any situation, hobby or interest requested. 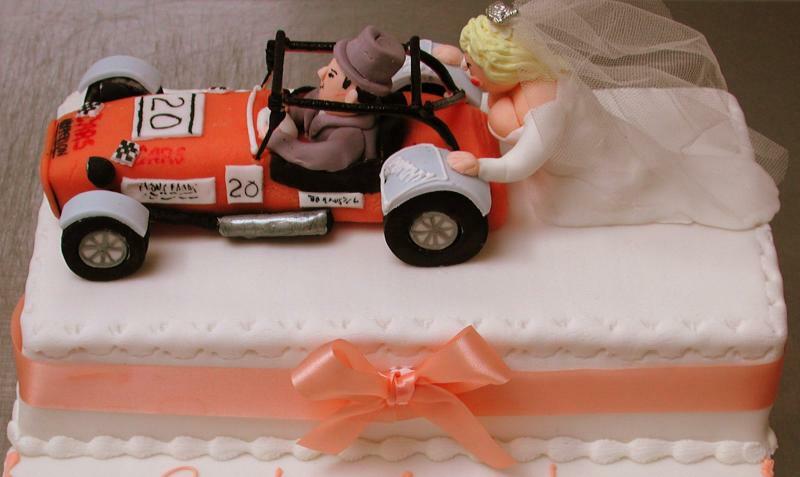 Prices are individually quoted as they depend upon the size of the cake required and the intricacies of the sugar paste figures. 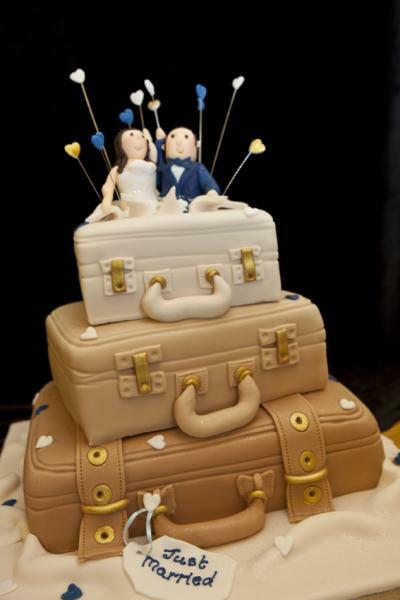 The Suitcase Stack is one of our most requested wedding cakes – everyone one of which is different. The three tier stacked wedding cake shown here can be made in finest fruit cake, sponge cake or combination of the two. 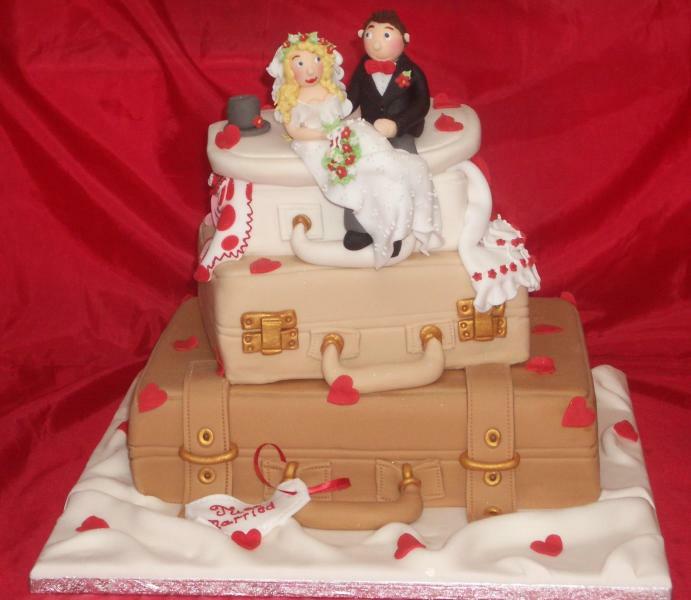 The cakes are covered in either brown or white fondant, and decorated to match your wedding colours or theme. In this instance the bride and groom chose a lilac flower spray on top of white cases to match their colour scheme, but this works just as well in a variety of different colour combinations. 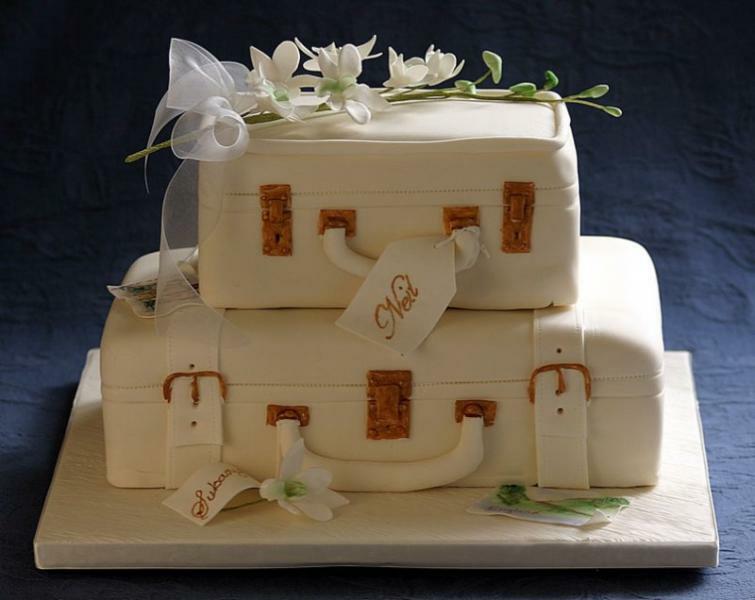 The suitcase labels are used to highlight bride and groom names and wedding dates. 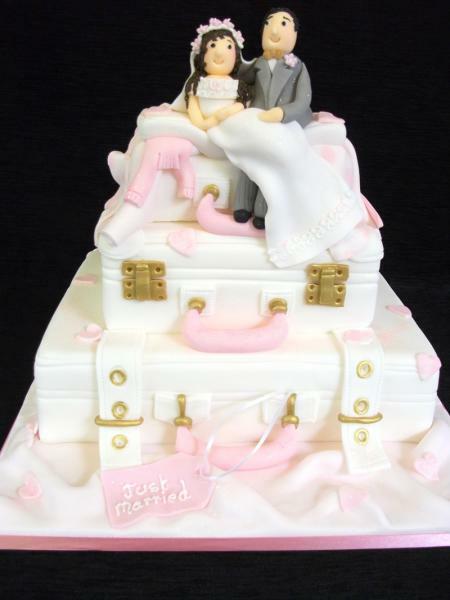 Prices start from £385, but each cake is priced individually depending upon the level of detail required. 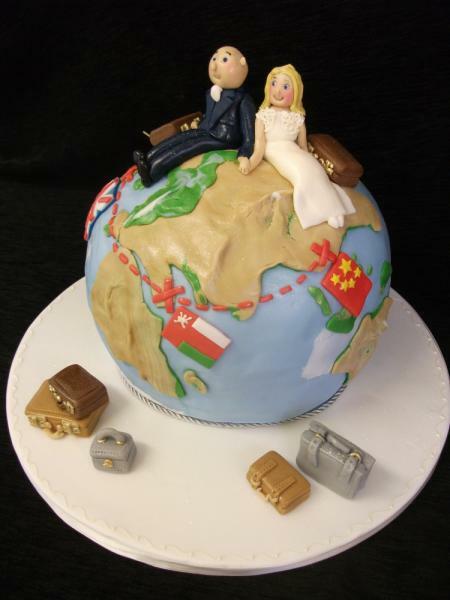 Probably our most popular novelty wedding cake, particularly amongst those planning a special honeymoon or marrying abroad and then celebrating back home. Two tier stacked wedding cake shown here in either finest fruit or sponge cake. We have in the past incorporated a wide variety of themes into this cake design with all kinds of “toppers” including sugar paste flower sprays, sugar paste figures, and real flower sprays. The design includes personalised wedding tags and themed confetti. 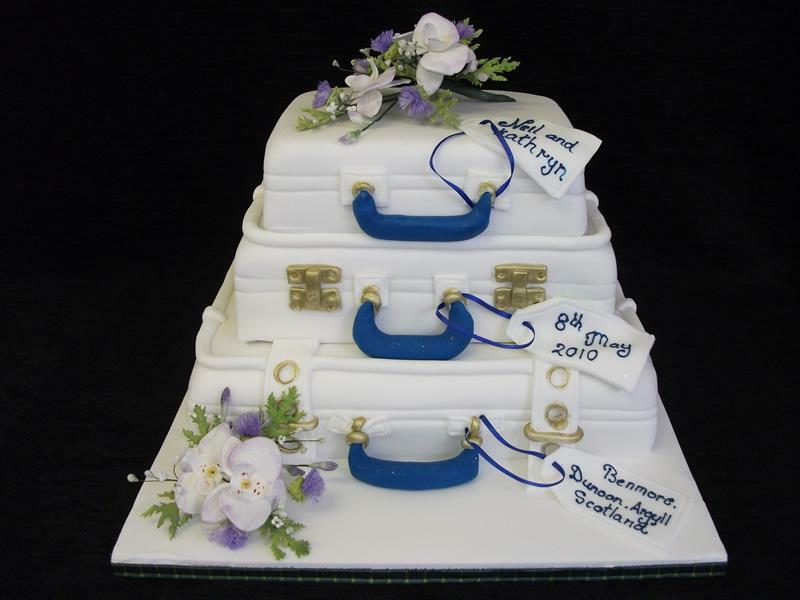 Prices start from £300 for a two tier cake in finest fruit cake. Sugar paste figures start from £30 each. 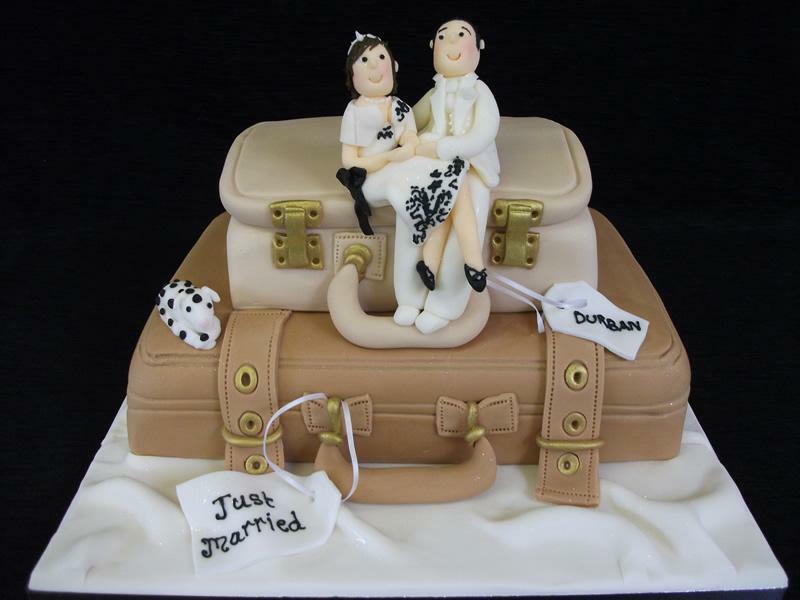 Probably our most popular wedding cake, particularly amongst those planning a special honey moon or getting married abroad and celebrating back home. 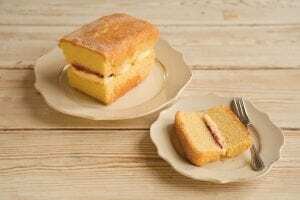 This stacked wedding cake works well in finest fruit cake, sponge cake or a combination of the two. We have in the past styled these cakes along many different themes and colour schemes. The design shown here is in “pink on white”. Stacked cigarello cakes are very popular and can be adapted in size to suit the number of guests to serve. 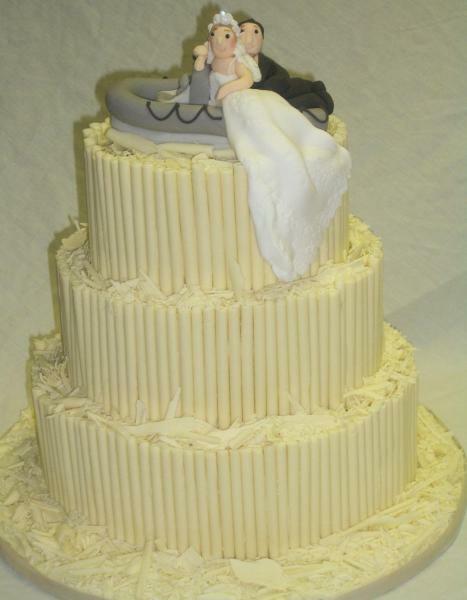 In this design, our clients requested sugar paste modelled figures of a bride and groom sitting in a rubber dingy – to tie in with thier favourite past time. Whilst this would not suit everyone, the idea can be adapted to any hobby or interest you may have.